USS Zumwalt stranded in Panama Canal towed by tug boats. (Compiled from articles by Kevin Miller, Portland Press Herald and Paul Szoldra, Business Insider on November 22) – The US Navy’s most technologically advanced warship broke down while transiting through the Panama Canal, the second setback for the $4 billion ship in the last two months. The propulsion system of the USS Zumwalt had problems while passing through the canal and had to be towed in to the former naval station Rodman in Panama. 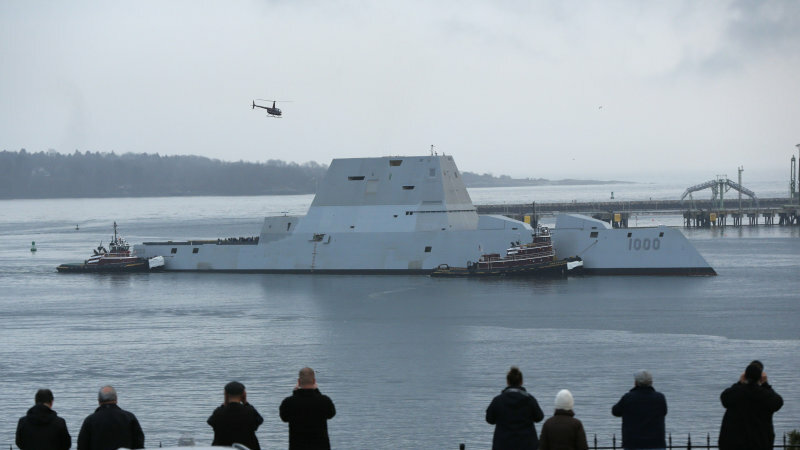 The ship lost propulsion in its port shaft during the transit and the crew saw water intrusion in two of the four bearings that connect to Zumwalt’s port and starboard Advanced Induction Motors (AIMs) to the drive shafts. The AIMs are the massive electrical motors that are driven by the ship’s gas turbines and in turn electrically power the ship’s systems and drive the shafts. Both of the shafts locked during the passage and the transit had to be completed with tugs. A spokesperson for the Navy wouldn’t say how long repairs would take, but one defense official said they could take up to 10 days. The official also said the Zumwalt made contact with the canal’s walls after the engineering problem, resulting in minor cosmetic damage. This is at least the second mechanical problem with the newly commissioned destroyer, although naval experts say such issues are common for the lead ship in a new class, especially one as packed with new technology as the Zumwalt. The Zumwalt is the Navy’s newest warship, a first-of-its-class “stealth” destroyer. The more than $4 billion Zumwalt is the largest and most technologically advanced destroyer ever built for the U.S. Navy. It took more than six years to build and features an electric propulsion system, new types of weapons and a sleek, angled shape and hull design that makes the 610-foot ship appear no larger than a fishing vessel on radar. Although much larger than the Arleigh Burke-class destroyers also built at BIW, the Zumwalt is able to operate with a smaller crew and is designed to get closer to shore to support land operations. The ship’s 78 megawatt gas turbine generates enough electricity to propel the ship through the water as well as power existing and future weapons systems, including lasers and “rail guns” under development by the Navy. Zumwalt is still in its sea trials phase, and is planned to be fully integrated into the fleet sometime in 2017 or 2018. Named for former Chief of Naval Operations Adm. Elmo R. Zumwalt Jr., the Zumwalt was designed as a multipurpose warship able to fight at sea and bombard targets on land with its missiles and new projectile system. The ship has a large landing pad for helicopters, drones and the new F-35 Joint Strike Fighter jets – another technology plagued with problems and cost-overruns – as well as an enclosed bay for launching the small boats used by Navy SEALs or other special forces. After departing Bath Iron Works shipyard in Maine (where it was built) for the final time in September, the Zumwalt was commissioned during a ceremony in Baltimore on Oct. 15 and was en route to its home port of San Diego when the latest breakdown occurred. Prior to commissioning, the Zumwalt also experienced a leak in a lubrication system for one of the ship’s propeller shafts, requiring repairs at Naval Station Norfolk in Virginia. But Navy officials praised the performance of the Zumwalt during at-sea trials this spring and summer. Two other Zumwalt-class ships are still being built, the USS Michael Monsoor and the USS Lyndon B. Johnson, at Bath Iron Works in Maine. Compiled from news reports by Portland Press Herald and Business Insider. Reprinted here for educational purposes only. May not be reproduced on other websites without permission. 2. What is unique about the USS Zumwalt? 3. List the features of the Zumwalt. 4. a) When/where was the Zumwalt commissioned? b) Where is the destroyer’s home port? 5. a) How many times has it broken down since being commissioned? b) For what reasons is this fact not a problem?